The roof on most homes are designed to last from 20 to 50 years on average when they are properly taken care of and regularly maintained. After some time, even the best roofing materials will need to be replaced however. And if you live in Livingston County we can offer roof replacement in Hartland Michigan by Livingston Roof Pros. When you get a new roof installed in Hartland Michigan by Livingston Roof Pros you can rest easy knowing that the roof is installed correctly and if there are any problems with the roof, we’re right here ready to help. I’ll go over some of the things you can expect when getting a roof installed by Livingston Roof Pros below. When the roof on your home is having problems with leaks or has reached a point where it must be replaced getting a new roof installed is a needed home improvement project then Livingston Roof Pros can help. Since getting a new roof isn’t something that many home owners get down more than a few times I wanted to go over just what you can expect when getting a new roof installed on your home in Hartland Michigan. Many times home owners want to change things up a bit when getting a new roof installed on their homes. The transition may not be as extreme as replacing an asphalt shingle roof with a metal roof. But it can be a much smaller choice which has more to do with roofing material styles and colors. There are even some newer type of asphalt shingles that are much better for use in places like Michigan and are called impact resistant shingles. They can better protect your home’s roof from ice and hail. But even if you choose standard roofing materials there are still literally hundreds of choices in designs and colors for the roof. Talk with a roofing contractor here at Livingston Roof Pros to learn more about the differences in the materials and what may be best for your home. Why Hire Us for Roof Replacement in Hartland Michigan? Ask any roofing contractor who is the best roofing contractor in Hartland Michigan and chances are they will list themselves as number one. While we think we’re number 1 too, we have a bit of customers who back us up on this. We’re a fully qualified and licensed roofing contractor in Livingston County Michigan. We don’t just install roofs and do roof repairs but we’re also part of this community. In fact, most of the roofing experts that are part of our team have worked in this area for decades. We care about our customers and want to do everything we can to make sure you are completely satisfied with any of the roofing services we offer. What Can You Expect After the Project is Complete? Once the roofing materials have been installed on your home we’ll do a cleanup of the area. This includes removing any debris from the roof replacement in Hartland Michigan and also use a strong magnet to remove any nails that may have made their way into your yard. We make sure that everything is back to normal and the roof is working correctly when we leave. The only thing you’ll need to do is enjoy to look and protection of your new roof. We realize that sometimes things happen and problems can arise. When this happens, we want to make sure that your home is protected. We offer emergency roof service in case problems occur and we also guarantee our roofing services as well. If there is a problem with a roof we installed, please get in touch with us as quickly as possible. As mentioned above, we’re part of this community and want our customers completely satisfied. 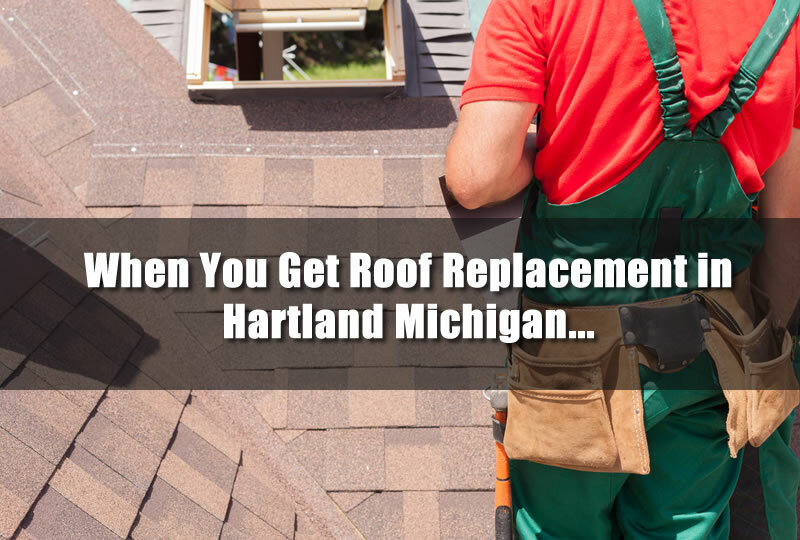 Are you considering a roof replacement in Hartland Michigan? If so, be sure to get a free roofing estimate from Livingston Roof Pros today. We’ve be happy to discuss roofing options for your home and can offer a full roofing quote for your home completely free. Contact us today at (517) 940-8770 for more information.